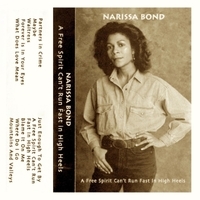 Narissa Bond's very first recording! Acoustic folk, pop, blues, and the voice of a young artistic talent at the beginning of her song craft. Highlights are: "Waitress", "A Free Spirit Can't Run Fast In High Heels", "What Does Love Mean", and "Maybe"
Recorded at Chapman Studios, 228 West 5th Street, Kansas City, MO 64105 & Modern Music Studios, 201 East Logan, Ottawa, Kansas 66067. This is my FIRST full length recording, completed with the help of many good friends. A Special Thanks goes out to my late friends and songwriters Beth Scalet, who's harmonica performance appears on "A Free Spirit Can't Run Fast in High Heels", and Jeanne Jasperse, who sings background on "Waitress". I truly miss you ladies. A special thank you goes out to songwriter Kathryn Lorenzen, who sings background vocals on "Just Enough to Get By", and donated studio time to the project along with Beth Scalet. Thank you to Shay and many others, for pushing me to start this project, and Rose Jones for giving me the Free Spirit title. Last but not least, I would like to thank Connie for providing me with inspiration for many of these songs. Thank you Midtown Printers for your quick turn around on the printing.